Harrogate CC captain George Ross said his young side must start learning from their mistakes following Sunday’s T20 Blast semi-final defeat to Woodhouse Grange. The Roosters have endured a difficult season in ECB Yorkshire Premier League North, winning just three of their opening 11 fixtures. And the ‘Gate skipper feels that the same problems that have cost them in the longer form of the game were evident during Sunday’s four-wicket loss at a sun-soaked North Marine Road in Scarborough. “It was quite a close game, but once again we’ve made mistakes at crucial moments and it has proved very costly,” Ross reflected. “It’s been the story of our season really, not making the right decisions at key times. “We got off to a good start and even when we lost a few wickets we should still have been able to set a defendable total, but too many of our batters have played rash shots. 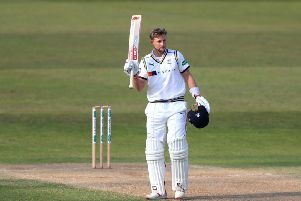 “At the start of Woodhouse’s innings it seemed like we didn’t have a plan in terms of the way that we were bowling and that allowed them to get in front of the game. “When a match starts to get away from us, we can’t hide or go into our shells, we have to find a way to do something about it. ‘Gate got off to a flying start in their last-four clash with opener Jack Potticary smashing the Woodhouse attack to all parts of the ground. He struck eight fours and two sixes in an explosive 21-ball knock of 48 before being caught on the boundary, just inches short of landing another maximum. His dismissal, which left his side 54/2, proved to be a huge turning point. Although Josh Atkinson (28) and Corrie Keable (20) kept the Roosters ticking over nicely for a spell, from 94/3 at the halfway stage of their innings the runs dried up and they could only muster 137/8. Woodhouse raced to 64/0 in six overs in reply before Ross took 3-20 and also effected a run out to haul his team back into contention. ‘Gate continued to turn the screw and the game went into the final over, however Grange eventually made it over the line with four deliveries to spare. Twenty four hours earlier, Harrogate lost out to Stamford Bridge by 66 runs in the league. The visitors managed to post 288/8 from their 50 overs at St George’s Road, despite some excellent work with ball in hand from both skipper Ross (5-65) and Ash Griffin (3-74). Atkinson (37), Will Bates (33) and Harry Stothard (32 not out) all made starts when the home side responded, as did Matthew Good - back from New Zealand for a one-match cameo - who chipped in with 30. The big score needed to carry them to victory did not materialise, however, and Ross and his troops had to settle for two points after closing on 222/9.